Successfully Added Android 4.4 Tablet "R10" - 10.1 Inch Screen, RK3128 Cortex A7 Quad Core CPU, Mali 400 GPU, Android 4.4, HDMI, OTG to your Shopping Cart. 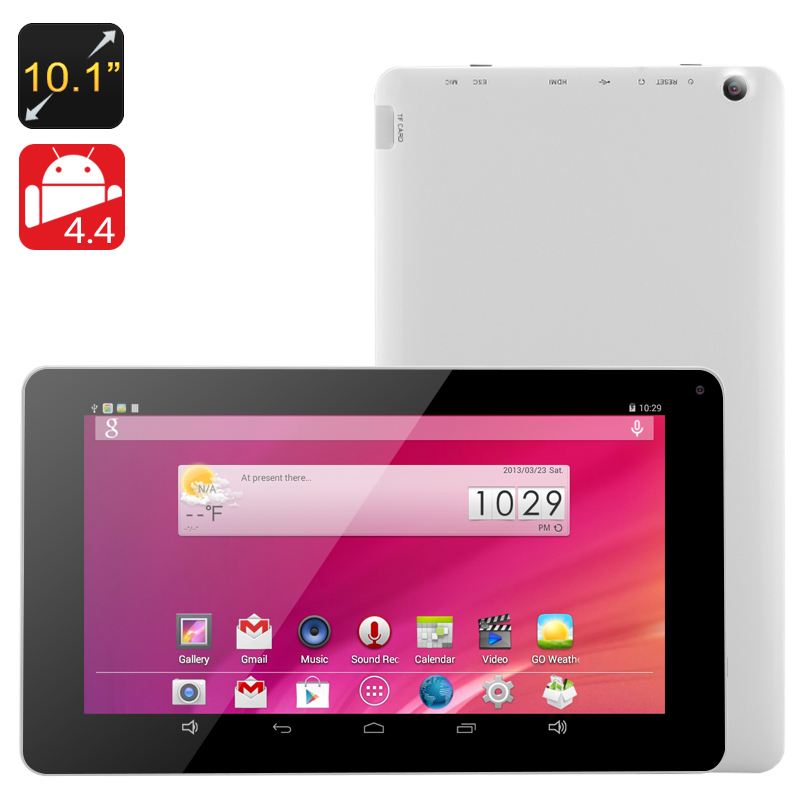 The "R10" Android 4.4 Tablet comes with a 10.1 inch screen, CORTEX A7 Quad Core CPU, GPU, OTG and Dual Camera. The size of the screen puts this model right in the top league of tablets on the entertainment scene. A large screen is the perfect setting for all your media, from movies to games and more. Android 4.4 is sure to provide enough content for you to enjoy the tablet in full, as you will have access to all the latest games and applications. A 10.1 inch screen is pretty much as big as it gets with Android tablets and would be enough for most users. However, if you still want more, the "R10" can deliver. Use the HDMI port to connect this tablet to a TV to give your media an even bigger stage. Not a fan of cables? Use the “Screen Cast” function in the tablet’s menu settings to project the screen onto a smart TV and enjoy the new way of looking at your tablet media. A great feature of this particular model is that it comes with OTG, or On-The-Go, which opens the door to a multitude of opportunities and lets you get so much more out of the already powerful device. Add a mouse and keyboard, hit the Play Store for some office apps and you got yourself a portable computer to work on your projects, presentations and reports. For avid gamers, connect a game controller and knock yourself out conquering new heights with the latest Android games. With a cortex A7 Quad Core CPU + Mali 400 GPU it will serve as a powerful base for all your multitasking needs and media graphics and with the support of up to 32 GB of external memory you will be able to load up the device with all sorts of entertaining goodness. This quad core tablet PC is in stock now, we guarantee next working day shipping and offer a 12 months warranty on all our products. Get a sample of this 10.1 Inch quad core tablet today to try out the amazing quality or directly place a big order with even more quantity discounts. We highly suggest resellers to get into the profitable 10 Inch and quad core segment of the wholesale tablet market and make attractive and sustainable margins. Brought to you by the leader in electronic devices as well as wholesale Android tablets, Chinavasion.